My altar as of Dec 2017. Photo by Grey Catsidhe. Many people reflect on the year upon entering its final hours. I’ve made a point to set some time aside and do so on my blog for many years, so here I am, keeping the tradition alive! I try to maintain various traditions in my home. It’s become even more important to me as my daughter grows. I find value passing on customs from my family as well as my religious tradition. One such tradition is cleaning the home, as best as we are able, on New Year’s Eve. This year was the first that she took part, manning the duster. She seemed proud to assist, although I know I have to go back and get all the corners she missed due to her height or playful negligence. As I scrubbed and swept, I reflected on one of my greatest achievements of 2017 – buying a home. Although it was not what I originally envisioned, I’m very proud and glad to have a place of our own. We have land to befriend, to plant, and I cannot wait to get started in the spring. It’s taking time, but we’re making it our own. I refinished a cabinet a couple months ago and set up my altar in the kitchen area. It’s still very much a work in progress. I intend to hang my Tree of Life tapestry above it, and I would like to install a shelf or two to display important images while tidying the surface of the altar itself. I need to organize other areas of the home, but I thought my readers would be interested to see my new altar space. Some may even take solace in the fact that it’s taking me time to get it where I want it – and even that will change as I do. As I reflected on my joy and gratitude for buying a home, I couldn’t help but think of the difficulties many in my generation face in grasping similar dreams. Like other millennials, I continue to struggle with paying off student loan debt, but, somehow, I’ve made it this far. I find myself pondering how I can give back to my community and help those who do not have shelter, especially in these frigid temperatures. My other great accomplishment this year has been completing a novel. I’m very proud of it. I’m still waiting for my husband to finish reading it, but I hope to share my story with a few others before I decide how to proceede. This year has found my creative spark reinvigorated. I’ve been writing stories and poetry, I delved into the world of cosplay to challenge and improve my sewing skills, and I even started to make candles here and there. It allowed me to connect with Brighid as I once did – as a creative person. For awhile, her mothering qualities eclipsed all others, so it’s been a bit of a rebirth for me. 2017 found me leaving certain aspects of my Druidism on the back burner, however. My formal studies have stalled. My flamekeeping has been on-and-off, something that riles up my old Catholic guilt. While I’ve maintained morning devotionals, my weekly rituals and meditations have been sporadic. No doubt, much of this was due to the disturbance and stress of moving. In all honesty, though, I’ve been exhausted from work, the news, and the seemingly ceaseless march of dishes and laundry. I chose, instead, to escape into fiction – my own and others’. I am hoping to restore balance in 2018. I want to continue my creative pursuits, but also renew my Druid studies, especially trance, magic, and divination. I need to set aside time for myself, but prioritize so that I’m truly doing activities that feed my soul and elevate my skill set so that I may better serve my family, my grove, my community, and my Kindred. I hope to take better care of my body and exercise more so that I’m not so damn tired all the time. Especially after work… And somehow, as I do that, I need to involve my daughter so that she feels included and sleeps better herself. Then I can have more quiet me-time when I need it. It’s difficult not to think of 2017 and the greater challenges our society faces. There are many shadows that will stretch into the new year. Many are too large for us to tackle individually. As I prepare my home and family for another year, I think about what I can do to make a difference. Just as I contemplate spring’s garden, I will plant seeds to make the world a better place in my little corner. Each of us has some power, some influence. As a mother, a wife, a daughter, a sister, a friend, a neighbor, a teacher, a writer, a sewist, a Druid – a person – may I be better, make better, and do better in 2018. Ever since Muin Mound Grove made candles with old candle wax for an Imbolc workshop years ago, I decided that I should try my hand at the hobby. It felt so right given my growing relationship with Brighid. A friend of mine made candles for awhile – huge, beautiful pieces of art, really. She gifted some to me, and the care she put into them… They were and are full of magic, whether she believes in that or not. I don’t think she’s made any for awhile, but they really inspired me. A grovemate made some in tins last year and gifted one to me before she moved away. I remember telling her that I kept meaning to try my hand at it again, and she was very encouraging. This Winter Solstice, some family members thoughtfully gave me gift cards to arts and craft stores. I used some of the money toward a candle making kit. It was a very simple kit with enough ingredients to make six soy votives in glass candle holders. I broke into it today and had a lot of fun. Before I started, I made an offering to Brighid as I consider this devotional work. The kit was very easy to use. I know I need to improve my method of securing the wicks to their dowels. Soy was very easy to work with, and I always prefer soy to paraffin, but I know I want to focus mostly on beeswax as it is one of the safest, cleanest waxes to use. I also know there are several beekeepers in the area, and working with a local, sustainable material that supports local bee populations is incredibly important to me. I’m not concerned with scents so I did not use the vanilla scent block that came with the kit. I’m not sure what it’s made out of and I’m very concerned with the purity of ingredients. As I learn, I may experiment with using natural fragrances for magical purposes, but I’m a huge fan of that simple beeswax smell. I have a growing list of tools I need to improve as well as other things I want to try. I’m hoping to pop in the local antique store this week. The owner has some kitchen bowls that aren’t too much money, if I remember correctly. That way I could reuse older materials without contaminating my kitchenware. 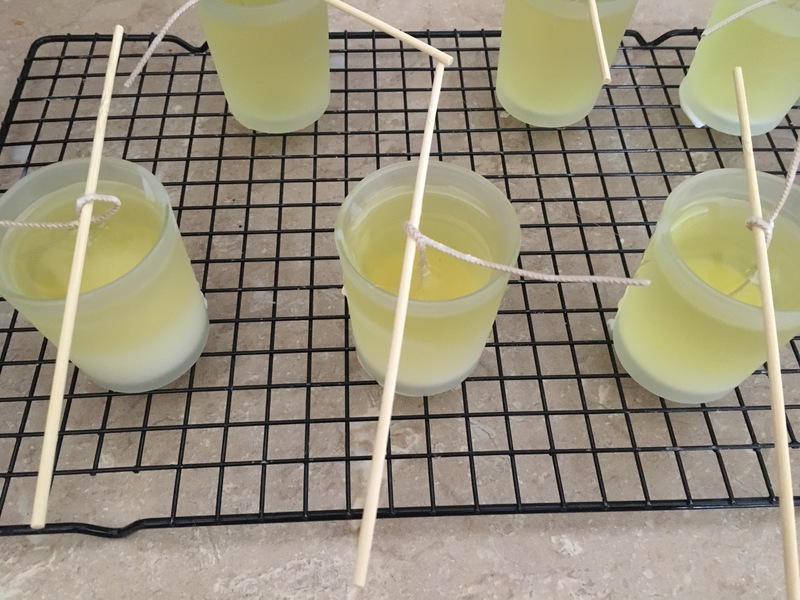 My next goal is to make simple hand-dipped candles for Imbolc, and my grove is also talking about making some soy crystal candles for our holiday workshop. ‘Tis the season for new beginnings and new activities, and as the wheel turns toward Imbolc, it’s such an appropriate time for me to learn these skills and incorporate them into my practice. We’re having a quiet day in because of the lake effect snow in Northern NY. We definitely needed some rest. I feel like I say this often, but December is so darn busy! It’s pretty cold and windy today, so while we enjoy watching the snow through the window, Bee hasn’t expressed an interest in going outside today, and I don’t blame her! What to do instead? Another thing to do on a snowy New Year’s day? Do some magic, of course! By the time I finished doing the physical purification on New Year’s Eve, it was time to crash and watch the ball drop then bang drums out the door to scare away naughty spirits. I was exhausted, and so was Bee. So first thing today, we did a simple saining ritual. My husband sprinkled purified and lunar charged water around the home while I held Bee and smudged with a handmade juniper bundle. As I stated in my recent post about winter activities for young toddlers, I believe that including little ones in family rituals is very important and helps teach them expectations for group rites. It lays the foundations for later, when Bee can take a more active part in our family traditions. Wherever you are, I hope you and are family have a very blessed 2015! 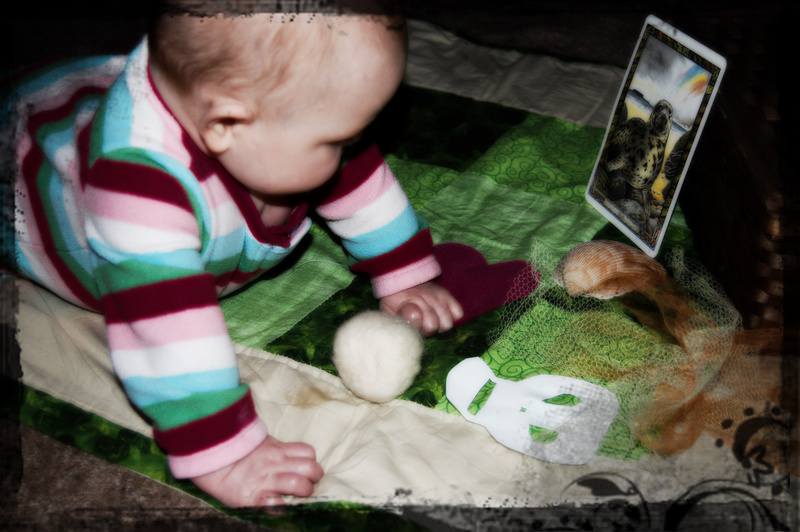 Look forward to more posts as I explore my Druidic path and how to share it with my little one! Thanks for continuing to read my random thoughts. I’m so happy to have inspired some of you! If you give a Druid a cup of tea, she’ll feel very content, almost meditative. She’ll be moved to give some as an offering to her Ancestors. So, your Druid will go to the household Ancestor shrine and realize that she should really clean it since the evergreens she placed on it for the Winter Solstice are all dried out. What’s more, New Years is coming, and a clean house brings good luck for the rest of the year! As she starts to clean the shrine, she decides that she should save the evergreen needles for “something” later on. So she finds a clean jar to store them in. Your Druid is smart, and she knows that she needs to label and date her jar. She goes to the drawer that contains the writing implements and chooses a blue marker to write “Blue Spruce – Winter Solstice – 2014” on the lid. While putting the marker away, she notices a small, green marker stain on the drawer. “Oh no!” she says, thinking what her landlady would say. So she wets a rag and begins to scrub. Thankfully, the stain fades, but your Druid notices dried food and other strange stains on the cupboard doors. So she continues to clean and clean and clean. After all, New Years is coming, and a clean house brings good luck for the rest of the year! Eventually, she gets really tired. She decides to finish later. At that moment, she realizes that she needs to drink her tea! She gets her cup but realizes that it’s no longer warm. It doesn’t seem hospitable to share lukewarm tea with Ancestors on a winter day. So you put the kettle on to make more tea. And you know what that means? It means your Druid will want to give some as an offering to the Ancestors but will need to continue cleaning the shrine! Although well into the New Year, I wanted to take a moment and conclude writing about my experience with Three Crane Grove’s Yule Along. New Year’s Eve was spent cleaning the home as best as we could to ensure that we could bring as much cleanliness as possible into 2014. No easy task with a little one to look after! While I’m proud of what we accomplished, I’m also proud of myself for just embracing the reality of the situation. Having a baby who is just starting to crawl will not lend itself to the spotless home of my fantasies. And really, being a creative person, I doubt I’ll ever have a spotless home. By coming to terms with that, I let a nagging stress go. There’s nothing wrong with aiming for cleanliness but to overshoot moderation and delve into a realm of constant self-critique is not healthy. Goodbye nagging stress, hello acceptance*! We also had a couple grovies over to ring in the New Year. A military family, they were away from loved ones and that saddened them. We welcomed them into our home for a super casual hang out. One of them, Holda**, is from Germany and wanted to share some of her German New Year’s traditions with us. We watched a black and white comedy sketch called “Dinner for One” which, apparently, plays non-stop in Germany at that time of year. She also introduced us to molybdomancy which involves heating lead, pouring it into a container of water, and interpreting the resulting shapes as signs for the New Year. This method of divination was new to me, and I really enjoyed experiencing it! We melted the lead in a spoon held over the candle flame. Photo by Weretoad, 2013. We poured the molten lead into a pot of water then removed it. We used a flashlight to see what shapes we saw and used them to predict 2014. We thought this looked like a ship. Photo by Weretoad, 2013. The next day, Weretoad and I spent some time putting away our Winter Solstice decorations. We put the evergreens outside and then I purified the home with some juniper incense. Overall, observing the 12 Days of Yule was a very rewarding experience. While not a traditionally Celtic thing to do, it helped me engage with the season in a new and meaningful way that extended beyond and blended nicely with the significance of the Winter Solstice. It also helped to bridge my celebration with my Christian family’s Christmas by setting aside a day to celebrate the spirit of generosity on the 25th of December. My husband participated in the rituals and that was really special to me. I would like to do it again in 2014 but pay better attention to the number of days. Well 2013, it’s been interesting. You had some great moments but also some really difficult times. You were a year of great change and growth. There was death and birth alike. We started the year performing a blessing ceremony on our apartment and then enjoying an evening with friends. The omens were good but I don’t remember what they were now. I wish I had kept that written somewhere. This year, I’m making a point to write down the omens I have been taking for the coming year. Excuse my language, but it seems rather half-assed of me to only look at the omens going in but not reflecting on them coming out! So, lesson learned! They say that the way you ring in the new year impacts your energy for the coming year. If that’s the case, 2013 was one of great friendship! They certainly helped me get through the difficult times and were there to celebrate the happiness I found. 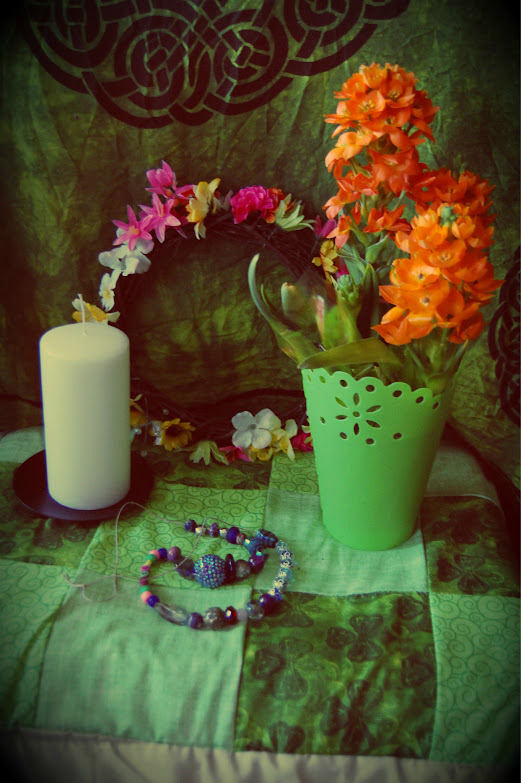 A photo of our Imbolc altar by Weretoad, 2013. In February, the North Country Druidic Study Group was reborn as Northern Rivers Protogrove, an officially recognized ADF protogrove! As we approach our one year anniversary, you can be sure I will spend some time reflecting on the successes and learning experiences so far. For now I will say that I’ve been so blessed to be part of this. I’ve formed so many wonderful friendships with people from around he world because of Northern Rivers. This month was filled with reflection and joy as spring was reborn! I spent some time with Muin Mound grovies, meditating on Ériu , and connecting with and relating to the energies of life and rebirth all around me. 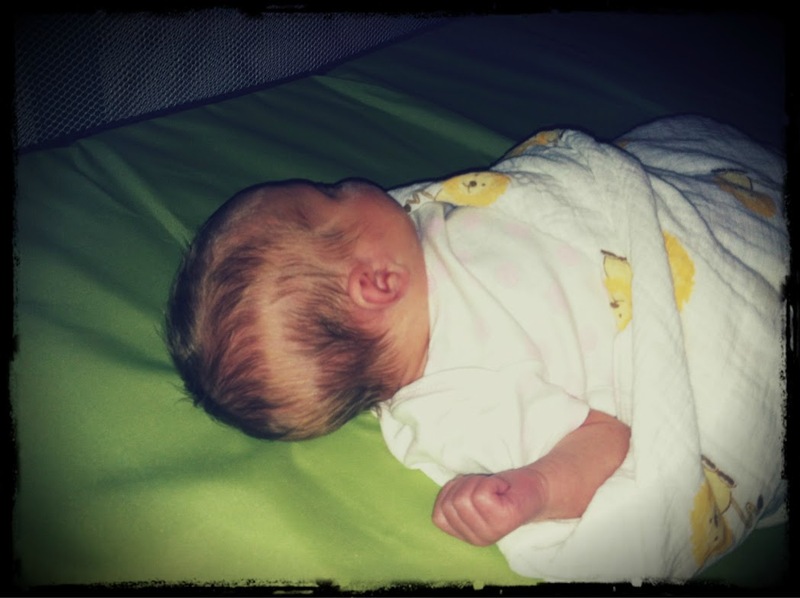 With morning sickness truly behind me, spring brought out a joyful period of Pregnancy. I started to feel like a Goddess myself! 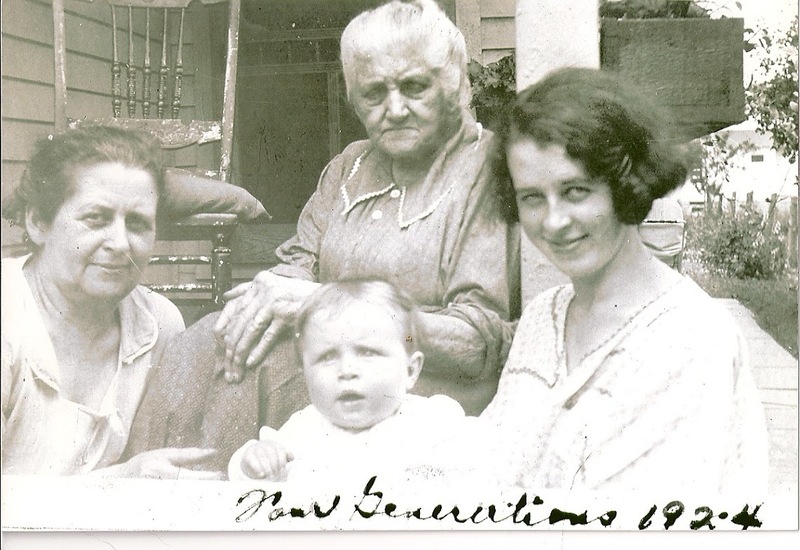 A photo featuring my grandfather as an infant. My grandfather died in April. It was not a surprise and definitely a mercy as his battle with cancer had taken away his quality of life. Prior to that, he had lived a long and very blessed life. I eulogized him here and honored him again at Northern River’s Samhain rite. The ordeal was very difficult on my family, especially my father, his brothers, and my grandmother who is only just coming to terms with the loss of her mate. Truly, nothing brings the blessings of life into crystal clear focus like death. Gifts from a mother blessing. Photo by Grey Catsidhe, 2013. My little girl. Photo by Grey Catsidhe, 2013. Oh, June. This month began with many difficulties. We had a difficult time moving into a new home to make room for Bee. Suddenly, I became unwell and then I went into labor early which resulted in a cesarean birth. June sent me a heap of challenges, but I put my faith in the Kindreds and myself, and I persevered. The reward was a beautiful, healthy baby girl. The magic I felt so strongly in May grew and transformed into something even more magnificent. New life arrived, and my role was elevated to mother. May Brighid guide me and protect my baby girl! This month brought more change, upheaval, and death of a sort. After a joyous beginning, the month ended with the revelation that my sister and former brother-in-law were no longer happy together. This resulted in a divorce that continues to sadden the tribe. So much had been kept from us for whatever reason that the discord came as a great shock. It was as if someone died because an illusion shattered and I no longer had a brother. The important things are that my sister and niece are together and safe, and that my sister is growing into a strong, independent woman. I am so thankful for my husband who, despite his annoying traits (which everyone has), dotes on me and the little one. We celebrated a quiet Lughnasadh as August opened and we found ourselves reeling from the events at the end of July. Spending time with grovies, old and new, helped to cheer us. This month also saw me growing in strength after the cesarean. I started to exercise again, and enjoyed wonderful walks with my husband and baby. The month ended with a wonderful surprise – we saw an otter in the St. Lawrence River right in Alexandria Bay! It’s something I had always hoped to see. For such a playful creature to grace us with his presence, it felt like the Kindreds were smiling on us and reminding us to find joy in life despite the difficulties. With autumn in the air and so much change in my life, I entered September reflecting on the creative and destructive sides of the Earth Mother. I returned to work and broke into tears multiple times, but I have remained strong in that regard. Balancing work, me-time, and time with baby has been difficult, but it’s become easier. We ended September with a baby saining for Bee. It was wonderful to celebrate her wee life with the Kindreds and loved ones, including old friends from Muin Mound Grove. October is one of my favorite months of the year. Samhain is a favorite holiday, so there was that, but Northern Rivers had a burst of activity! Tara lead a wonderful workshop on gems and crystals and we went for a walk around the new “Area 51” sign which celebrates the supposed vortex in Watertown’s Thompson Park. We excitedly prepared for the upcoming Samhain ritual which was amazingly successful! Bee playing with her Druidic treasure basket. Photo by Grey Catsidhe, 2013. The year ended with ups and downs that we persevered through with the help of loved ones. I lead a Winter Solstice ritual for Northern Rivers that didn’t go was I had hoped. I have been fretting and reflecting on it a lot, but my grovies have been really encouraging and understanding. Rather than throwing in the towel, I’m going back to basics and reading all I can about ADF’s COoR. The group will be meeting later this month to discuss ADF liturgy, brainstorm ideas, and plan for Imbolc. We must take these things as learning experiences! Rather than becoming entirely consumed by one public ritual, I also threw myself into the 12 Days of Yule lead by fellow ADFers from Three Cranes Grove. It’s been a very special experience because it helped me bridge my Druidic practices with my Christian family’s, and it became something my husband and baby did every night with me. 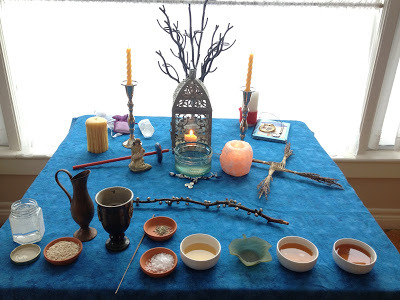 It meant so much for my husband, especially, to help me with each little ritual. He’s even started to say the words with me and doing some minor divination. I’m really hopeful that we can keep it up with weekly devotionals. Potion, our beloved ferret. Photo by Grey Catsidhe, 20??. 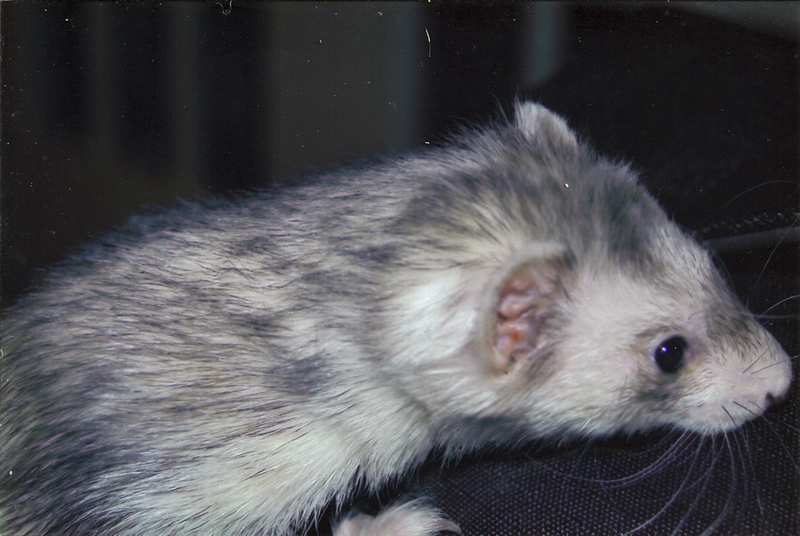 Right before the Winter Solstice, we lost our dear friend Potion the ferret. As I recently wrote, it was expected. That didn’t make it any less difficult. At the same time, we know she is in a better place and that her suffering in this realm has ended. And with that, the pain and difficulties I faced in 2013 have ended. My body has been healing, the dead have been mourned, and the transformations accepted. More importantly, my family has embraced our blessings and thanked the Kindreds for them. Now it is time to look ahead to the possibilities of 2014! May everyone reading this have a wonderful New Year! Yesterday, my husband and I prepared for a home blessing ritual I came up with for the New Year. We cleaned for the occasion as well as we could. I am sad to admit we were not able to move things around in the art room, so my altar remains in a state of flux, albeit a functional flux. The piles of snow outside, and my inability to lift heavy objects right now, means that we have to wait on phase two of “operation return my altar to the art room and convert the bedroom nook into a nursery.” However, the bedroom is the cleanest it’s been for months. We’re all caught up with laundry, I gave the carpet a thorough vacuuming, we bagged old clothes for donations, and my husband removed a cabinet that’s been sitting in the middle of the floor for a month since we started moving furniture around. 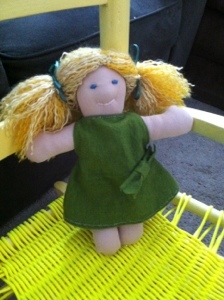 It had become an obstacle for me at night during my frequent bathroom visits, and it sat near my altar. Piled with laundry, it added to a sense of disorder. Well, that’s taken care of and I feel it’s very symbolic indeed! It’s said that what occurs as the old year turns to the new will set the tone for what’s to follow. And while our modern calendar is man-made, and this can be said of any New Year celebration*, it’s difficult to deny the power of such a sentiment. It’s a type of sympathetic magic, an internal magic. I very much hope that our little one comes into a clean world and that we have few to no obstacles in 2013! The family altar set up for our New Year blessing ritual. Photo by Grey Catsidhe, 2012. 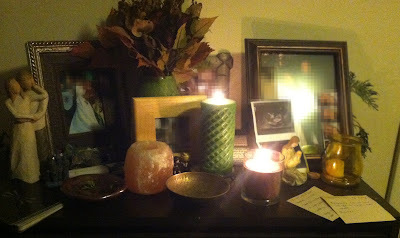 After the sun set, and before heading to a friend’s New Year’s Eve party, we prepared for the home blessing. As you know, I’m not using incense indoors during my pregnancy. It’s common for people performing house blessings to smudge away negativity. I decided to make an herbal infusion. I selected herbs with symbolic or literal qualities that I desired for the coming year. I poured hot water over them, added a few drops of lavender oil for peace, and some vinegar for purification. 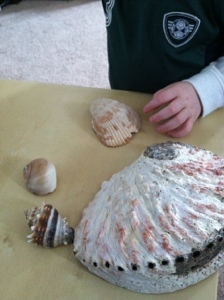 We made offerings to the Kindreds for all the blessings of 2012, sprinkled the infusion around the house while chanting our prayer**, then did a reading for the New Year using the Druid Animal Oracle. The omens were quite good, and we left for the party pleased. We ended 2012 with friends, blessed in so many ways, and in pretty good health. We begin 2013 the same way. Here’s to a wonderful New Year! Go make the most of it! *Samhain, the traditional Druidic New Year, came at such a busy time. We observed the holiday but did not do much to mark the New Year. It was very important for me to take the opportunity on this secular occasion. ** We said a very simple prayer inspired by some of Ian Corrigan’s work, but if you would like something more poetic and historic, Woden’s Wandering Witch shared a Pagan rewrite of a New Year’s prayer from Carmina Gadelica.